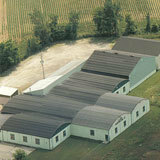 Clark Perforating Company, Inc. is a family owned and operated business established in 1948. The company has been at its present location since 1954 and is managed by the fourth generation of the Clark family. Clark's management has experience doing one job well: supplying perforated metal and material in coil, full size sheet, and cut-to-size blanks. Clark is known for the top quality of its perforated material and its fast and reliable turnaround time. Every phase of your job — from metal dies to complete perforated metal sheets — is completed in-house, permitting the tightest supervision of manufacturing procedures and prompt service at competitive pricing. As part of a program of continuing upgrading and improving of manufacturing equipment and operations, Clark has been enlarging its sheared blanks production facilities. New, state-of-the-art computer-controlled presses capable of high speed operation and high accuracy offer you lower-cost sheared blanks with margins 4 sides. Fast turnaround, cost efficient, short and long runs available. Quality Policy: "Producing quality parts that strictly adhere to our customers requirements and delivering them in a reliable and timely fashion."